Foolishly, he'd assumed he'd get a job at Saint-Laurent as a gardener. Such stupid faith in your hopes and dreams is one of the dangers of prison life. The past is dead, the future stolen away, the present an endless desert - so you retreat into a fantasy world, where finally you're in control. Among the lifers he's known, Sabir has seen the syndrome time and time again. You lose yourself in grandiose plans, unrealisable dreams, until life becomes a mirage. And escape can be the worst dream of all. Of course, it's ironic that, as we read of Sabir's realism about escape from a South American prison colony, we are ourselves seeking a form of escape. The novel is the dream. 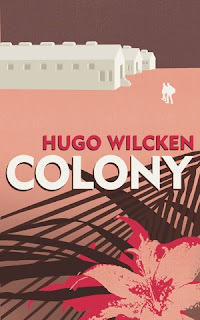 Hugo Wilcken's Colony is a compelling flight into the unknown. In this it has the same relentless quality as Cormac McCarthy's The Road. Yet, unlike that novel, Colony also begins to unravel the dream. By using what might be, in other hands, a generic tale of prison life and intrigue between guards and inmates, Wilcken has dramatised - Beckett-like - the threat lurking within the uncanny power of storytelling. It's a terrific read. I had wanted to write a full review because the novel deserves attention, but that would involve outlining the plot. While this usually isn't a problem with the books I tend to review, in this case it might spoil your own discovery. So instead, just read it. "So instead, just read it." Oh... all right then. Odd cover though - it looks like the sort of design we associate with small presses, so I was surprised to see it's published by Harper Perennial.